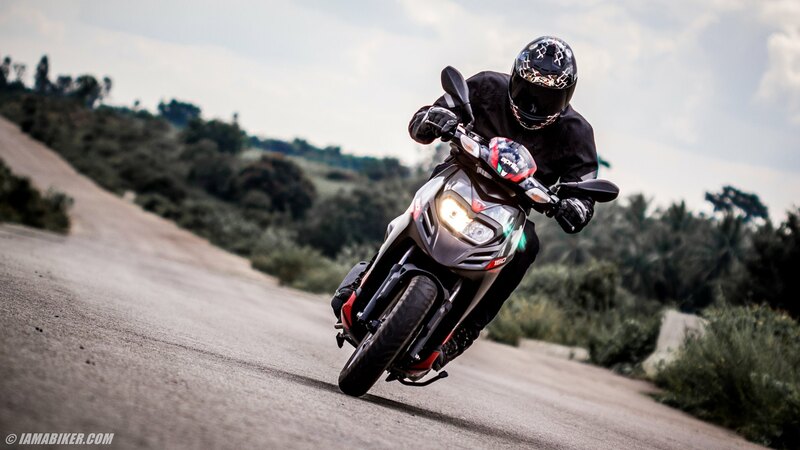 Aprilia SR150 review - first ride | IAMABIKER - Everything Motorcycle! What’s in a name? Well, when it spells out Aprilia, a lot! This badge suddenly brings in a lot of expectations to whatever it is attached to. So when we first saw the Aprilia SR150 at the Auto Expo earlier this year, we just could not wait to get our hands on it. 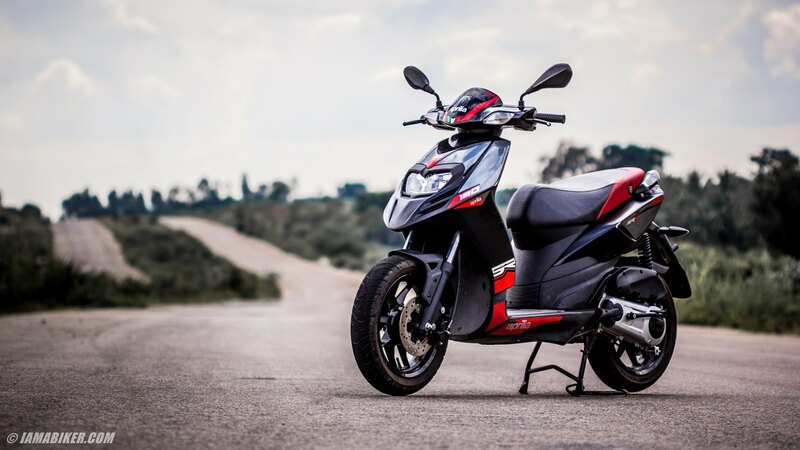 The scooter market in India is growing at an amazing pace and we think Aprilia (Piaggio) have made a smart move to create a new segment rather than stick to the 100-125cc one. But enough of all this, lets speak about the scooter it self. Lets first get the numbers out of the way. This 154.8 cc engine produces a max power of 10.4 HP at 6750 RPM and a healthy max torque of 11.4 Nm at 5000 RPM. The scooter weighs 122 kilograms and comes with a 220 mm front disc brake and a 140 mm rear drum brake. It has 14 inch 120/70 section tubeless tyres made by a Thailand brand called Vee. These are the biggest tyres seen on a scooter in India, section and rim size wise. And finally the fuel tank capacity is 6.5 litres. Other key features include telescopic front forks, alloy wheels and twin headlights. Phew, now with that out of the way lets talk about the ride experience. The Aprilia SR150 looks sharp, tall and fast. Both the colour options (Matt Black / Glossy White) sit well with the scooter. Once you are on the scooter you however wish it had a more substantial front end but that’s just a personal opinion. I am 5’11 and was able to sit comfortably on the scooter with plenty of room for my legs and not once did it come in contact with the handlebars while turning. Start the scooter and you are almost happy to hear a not so familiar sound. All the scooters these days seem to be trying to achieve the “Activa” success and end up being quite similar. But not the Aprilia SR150. It has a unique note and a kind of brashness associated with it. Conventionally, 150cc is motorcycle territory and the SR150 sure has some stiff competition there. 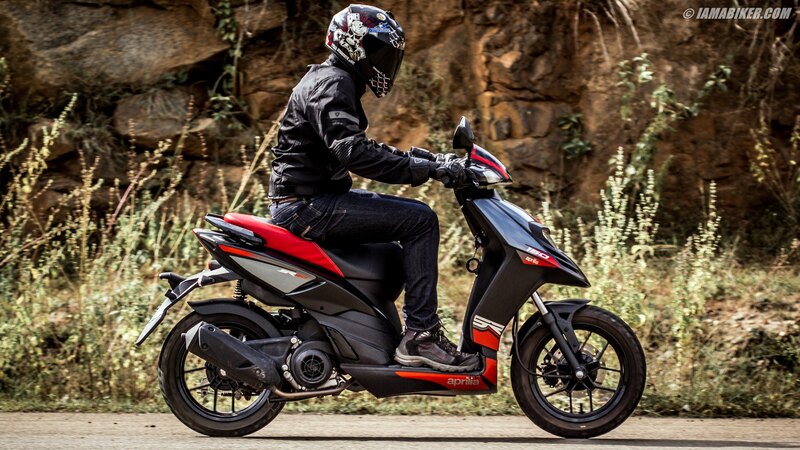 But being a 150cc scooter, the power figures are actually not that exciting and combine that with the CVT gear box and its not exactly quick off the mark. Don’t get me wrong here, it is most definitely the fastest scooter currently in India but like I said earlier, when you attach a name like ‘Aprilia’ to it, expectations are usually running quite high. Personally I would have loved a bit more initial punch to make it more exciting in the lower RPM’s, after all this scooter will spend most of its life in the city where top speed really does not matter. But what it lacks in the low end, the SR150 makes up for in the mid range. You can easily cruise at 70-80 km/h and still have enough grunt to overtake. On a straight patch of road, we even saw 120 km/h on the speedometer. Even with a naughty throttle hand the mileage returned by the SR150 was near the 40 km/l mark , so expect higher figures during regular ‘sane’ use. Apart from performance there is also another word that comes to mind when we hear the word Aprilia, and that is – handling. This is where the Aprilia SR150 truly shows it pedigree. It is an absolute joy to ride. The 120 section 14 inch tyres provide a lot of roll around space to lean and is not upset by small potholes like regular scooters. The front telescopic suspensions although stiff provide good predictable behaviour, again ensuring very good handling. The scooter is quite well balanced and weight distribution is spot on. Low speed U turns, quick direction changes, navigating through traffic, you name it, and the SR150 excels in it. I would even go on to say this is the best handling scooter in the market currently. Even with a pillion things are comfortable and easy to handle. I especially liked the nifty design of the pillion foot pegs. They fold and integrate into the body when not in use. The brakes too are extremely good. I especially love the lever feel, you get a good firm grip and the brakes by themselves are spot on. So, is it only all good with the SR150 you ask me? Actually, Yes. Well, how do I put it, the Aprilia SR150 is what you would call an enthusiasts scooter. You should want it because of the way it performs and handles and not bring in words like ‘price’ and ‘practicality’. To draw a parallel, lets call it the R15 of the scooter world. It stands out, it demands a premium and you get what you pay for. But to be really honest I would have loved to see better features thrown in; an improved instrument console and an external fuel filler cap would have made it perfect. Also at an ex-showroom price of Rs 68,336/- in Bangalore, you really would think they would throw in a side stand as standard fitment and not as an optional extra.